Tsukemen Kirari is a three minute walk away from Keihan Chushojima station. This restaurant is famous for the way they combine fish and pork bones broth in their tsukemen soup. If you haven’t heard of tsukemen before, it is a type of ramen where the noodles and the soup(tsukejiru) come in separate bowls, like zarusoba, soba noodles on a bamboo draining basket. You eat tsukemen by dipping the noodles in the soup. The soup is usually thicker than normal ramen soup. The thing that separates Tsukemen Kirari’s tsukemen from the others is quality. Usually the noodles used in tsukemen are thick, but even among tsukemen noodles, Tsukemen Kirari’s noodles are exceptionally thick. Even though the noodles are really thick, they are not hard or difficult to eat, but, dare I say, form an ultimate harmony between the tsukemen noodles and the soup. The service is sincere and polite, and the feel of the restaurant is nice, but what really impressed me was their passion and devotion to tsukemen. When you look at the waitresses busily taking orders, the serious looks on the cooks’ faces, you will be sure you are getting top-class tsukemen. Tsukemen Kirari is only open from 11:30AM to 14:30PM, and they are closed on Wednesdays and Thursdays, so make sure to check the day and time before you go there. The tsukemen that Tsukemen Kirari is most famous for is their fish and pork bones soup tsukemen. The soup(tsukejiru) is a pork bones based that with the addition of the fish broth makes for a deep and rich taste. The rich and dense soup sticks to the thick and chewy noodles. For the tsukemen lovers who like a rich soup, this is a dish you cannot resist. I would like you to add some citrus sudachi vinegar or raw garlic to the noodles after you have eaten some so you can enjoy the change in the taste. I am sure you will be impressed by this new taste. On top of the noodles there is a creamy soy-marinated soft-boiled egg, chewy menma bamboo shoots, seaweed, and in the soup white leek and chashu Japanese braised pork. Tsukemen Kirari’s other specialty, their shrimp tsukemen. This shrimp tsukemen is decidedly different just a “shrimp taste” tsukemen. The soup of this shrimp tsukemen is shrimp itself! The soup is so full of the taste and fragrance of the shrimp that you would think the noodles had gone through not soup, but a bucket of shrimp. On the other hand there is none of the fishy smell or bitterness of shrimp present, and the umami and sweetness of shrimp are extracted in a mind-blowingly superb way. You eat this soup that has capsulated the essence of shrimp with the thick chewy handmade tsukemen. Can there be anything better than this? The shrimp tsukemen is limited to 15 portions a day, so if you want to have some I recommend you line up before the restaurant opens. Tsukemen Kirara also offers ramen, their offering being the salt pork bones ramen. Just because it’s ramen by a tsukemen restaurant you shouldn’t look down on it. The conventional wisdom is that if a ramen or tsukemen restaurant has really good noodles, their other offerings will be great too. In accordance with this conventional wisdom, this ramen at Tsukemen Kirara is delicious. It has the same fish and pork bones based soup as the tsukemen while adding some saltiness to make an exquisite bowl of ramen. Recommended for those who prefer ramen to tsukemen. This is a rice side dish that bears the name of the restaurant, Tsukemen Kirari – Kirarimeshi, meaning Kirari rice. This is a really unique side dish. It is rice with mixed grains containing normal white rice, brown rice, Japanese millet, foxtail millet, and other grains, all together making for 16 different types of rice and grain. Compared to normal white rice it has more nutrition and a firm, chewy texture. Compared to white rice this “healthier”, mild taste goes better with the rich taste of Tsukemen Kirari’s tsukemen. If you order tsukemen, I recommend you get some Kirarameshi too. First you have to buy a ticket at the machine. Put money in and choose the ramen or tsukemen you want and press the button. 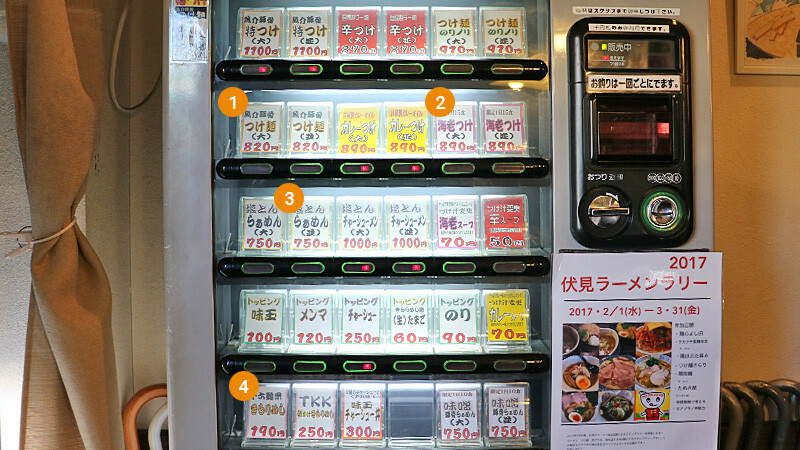 If you can’t decipher the machine, speak to the staff in English and they will hand you a menu in English. This way it will be easy to know what you are ordering. At Tsukemen Kirari the ticket buying timing is a bit special. When a lot of people are lining for the restaurant, when you get close to the entrance the staff will come and tell you to go buy a ticket from the machine, and after buying this ticket you line up again. Of course if there is no line you can just go inside and buy the ticket, but as this is a really popular restaurant you should be prepared to line up. But if there is a line, wait until you are told to go buy the ticket. This is my recommended way of eating tsukemen at Tsukemen Kirari. 1. Taste the deliciousness of the noodles Don’t dip the noodles in the soup at first, but taste the handmade noodles as they are and enjoy their texture and taste. 2. Know the balance between the soup and the noodles Dip some noodles only halfway to the soup and try to find a good balance for yourself. 3. Just concentrate on eating Taste the noodles and the soup freely, eat with vigor. The best way to eat is to slurp the noodles into your mouth with such force that the soup sprays all around. 4. Enjoy the change in taste Put some of the citrus sudachi vinegar or raw garlic on the noodles or into the soup and enjoy the change in taste. 5. Add some diluting soup to your tsukejiru soup After finishing all your noodles, add a little bit of diluting soup that is on the table to your tsukejiru soup, so you can drink all of the soup. Add the diluting soup little by little all the while tasting the change in the tsukejiru soup’s taste. *You can also put rice into the tsukejiru soup If you get the slightly more expensive Tokutsuke(1050 yen) you also get rice which, after you finish eating your noodles, you can put into the tsukejiru soup. The owner of Tsukemen Kirari started the restaurant as homage to Ginjo-Ramen Kubota, one of Kyoto’s most famous ramen restaurants. The owner of Ginjo-Ramen Kubota has also recognized Tsukemen Kirari to have outstanding tsukemen. While they are most famous for their fish and pork bones broth, I personally would like to recommend their shrimp tsukemen. Maybe it is only because I really like shrimp, but when I first had shrimp tsukemen I thought to myself, “I could eat this until the day I die”, it was so good. The taste of the shrimp is condensed in the tsukemen and really addictive. If you like shrimp, you have to taste this. Tsukemen Kirari is a really popular restaurant on the Fushimi – Chushojima area. The deliciousness of their thick tsukemen noodles, almost as thick as udon noodles, is top-class in Kyoto. I can recommend everything on their menu, but my favorite is their shrimp tsukemen! The shrimp tsukemen is only sold in limited quantities, so if you want shrimp tsukemen I recommend you get there early. There are many sake breweries in this area, so how about having the best tsukemen in Kyoto with your brewery tour? 3-minute walk from Keihan Main Line, Chushojima Station. The staff can understand some really simple English.